Your Essence, Martyr may serve as a marker of the boldly new and life-changing shift in Urdu literary culture. Certain spiritual archetypes and dedicated poetic forms are addressed to current social and personal issues. The seventy poems selected by the editor were written in Urdu in the late 1970s by various poets, following the hanging of Prime Minister Zulfikar Ali Bhutto by the military regime of the time. Kept out of books by Pakistan’s dictators but preserved as samizdat, they have been put together in this first translation. Mostly, these are elegies for a national leader and for an epoch of exalted community values disfigured through misfortune and harsh times. Expertly edited and translated by well-respected scholars and poets, who worked from the original texts, the poems here represent classical as well as modern lyrical genres in passionate contemporary voices whose distinctive treatment and tone are hard to miss. It is astonishing to see how various styles respond to the controlling theme. The main Urdu poetic forms, such as the ghazal and nazam as well as the solo couplet and qit’a, are shown here to be potent vehicles of the new sensibility. Some conventions of the Urdu marsiya (elegy), too, are echoed. Yet these poems effectively assure a sensitive focus on a secular subject in a temporal context. As the editor’s preface has it, “Your Essence, Martyr is the heart’s cry, a book of poems that have become a part of our lives since these were written. . . . The work has survived and lives on as a soulful example of the deed against tyranny.” The authors of the work would make a veritable Who’s Who of South Asian Urdu poetry: Hamed Jilani, Javed Shaheen, Ahmad Faraz, Kishwar Naheed, Ahmed Waheed Akhter, Salaam Bin Razzaq, Shohrat Bokhari, Farigh Bukhari, and Faiz Ahmed Faiz, to name only a few. Clearly, poetry (in all major languages) in Pakistan has embodied and championed the democratic spirit during difficult times. This is a poetry of courage, conviction, and compassion; a priceless treasure. 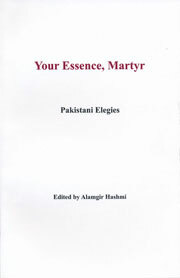 Your Essence, Martyr is edifying as responsible art, a book of poems that belongs on every serious reader’s bookshelf. Hassouna Mosbahi, Max Weiss, tr. 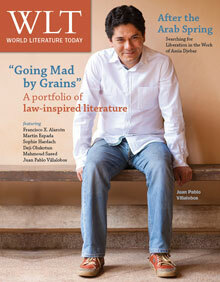 A portfolio devoted to Law and Literature headlines the November 2012 issue of WLT.